This was written for June-July’s Blogs of the Round Table, on NPCs in video games. Perhaps you’re meant to have meaningful, deep interactions with characters in games that can actually speak. But they’re all just robots. Interact in a certain way, as a blank avatar, and they will love or hate you regardless of who you are. They are obviously a series of lines responding to inputs. Or, if my avatar is a specific character, they’re responding in a story that I don’t feel is mine. I don’t have intimate relationships with characters in books either. I might like them, or admire their actions, but I don’t have deep meaningful interactions with them. Ralen Hlaalo is different, because he is a cupboard. Balmora, with some pretty textures. 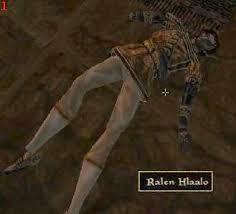 Ralen Hlaalo is dead, to begin with. He lived in Balmora, a town on the south-west side of the island of Morrowind, to the north of Vvardenfell, where the Dunmer live. 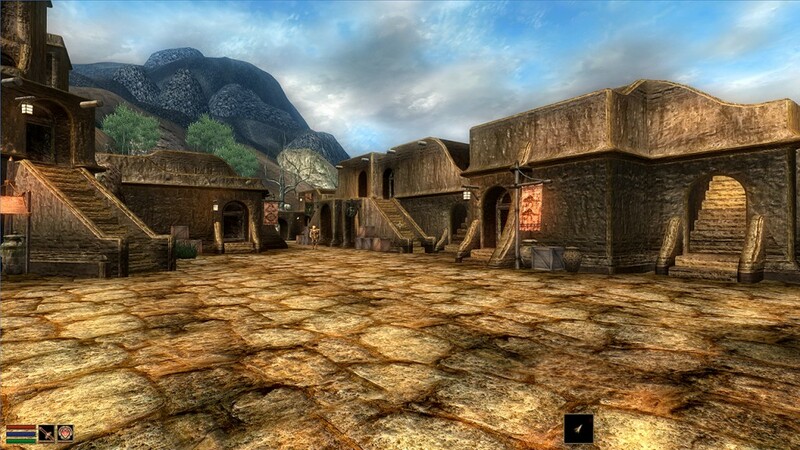 At the beginning of Morrowind, the third Elder Scrolls game, you arrive by boat in the tiny township of Seyda Neen. From there, you’re directed to Balmora, which is – if you want it to be – a hub area for at least the first few levels of your game. It has a Mages Guild, a Fighters Guild and a Thieves Guild; it has good transport connections and is conveniently located for exploration. It’s also the ancestral seat of one of the three families that rule Morrowind: House Hlaalu. They’re into diplomacy and trade and sneaky business. They’re also mega-rich, which makes them targets. Ralen Hlaalo has been murdered, and his body lies face up on the carpet of his luxurious home west of the river. His maid stands in her room, waiting for you to pick the locks or acquire the keys to the house and ask her about what happened here. Later, when your Sneak gets high enough, you can probably pilfer the contents of her jewellery box and her copies of Vivec’s sermons off her shelf, and then shut the door again, knowing she doesn’t need food or conversation or even the little luxuries the game originally gives her. The Hlaalo manor is one of the better options for a starting house, once you can get into it. It contains a vast array of containers – crates, barrels, chests – and a bed where you can sleep in peace; it has a wall of excellent shelves you can use, if you’d like, to display the many treasures you’ll acquire over the course of your time in Morrowind; it’s full of stuff you can just take right now and fence to the Khajit down the road, and no one will stop to ask what you’re doing with all those glass bowls and tableware that used to belong to that nice Mr Hlaalo, so recently murdered. You can get a decent start in life from Ralen’s end. But even after you’ve stripped the clothes from his corpse, his body will remain. It will be there forever. Later on, you will come to realise it is a more powerful asset than almost anything else in the game when it comes to boosting your income. Because Ralen Hlaalo is an infinite cupboard. I’ve seen this guy a few times. 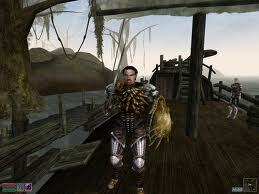 A few words on how Morrowind’s encumbrance and travel systems work: they are designed to frustrate you. They are designed to be difficult to navigate. Morrowind is a walkable game, made before “walking simulator” became a term of vague disapproval. It wants you to walk between travel points, not bamf around a map with fast travel. It wants you to plan journeys. It wants you to discover familiar paths and shortcuts, to get to know the landscape intimately, to be excited about the first time you travel somewhere. I have walked south from Balmora so many times I could do it in my sleep. Whenever I move house in the real world I start a new game of Morrowind so I can walk from Seyda Neen to Balmora and from Balmora to Hla Oad, just for the familiarity. There are a few systems for fast travel. There are boats in seaside towns, each one of which visits a limited number of locations; you may have to chain trips together. There are silt striders, tall weird insect buses that visit a few landlocked cities each. There are Mages Guilds, each one of which has a teleporter inside to access all the others. Then there are teleportation spells: Divine Intervention, which will transport you to the nearest Imperial Cult shrine, and Almsivi Intervention, which takes you to the nearest Tribunal temple. 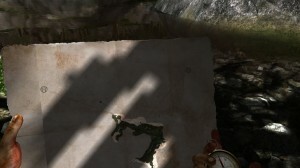 The map that came with the game, which is the only real way to find out about the forts. And there is a network of forts littered around the landscape, not one of which is ever relevant to the story, each one containing one teleport pylon that can take you to two other forts, and one lockstone that opens it up as a destination. Also normally they contain significant numbers of orcs. Opening them up is the sort of quest that matters only because travel is a limited, finite resource. It makes Morrowind feel incredibly dated. It is also one of the reasons why it has stuck with so many people as a game with such a powerful sense of place. Encumbrance is a problem. A lot of the best loot in Morrowind is heavy – raw ebony, raw glass, Dwemer pots and scrap metal – and the average dungeon is large and contains many shiny things that, if you are a looter like me, you will itch to possess. You don’t just slow down when you’re carrying too much loot for your character’s stats: you stop completely. You can’t drag yourself out of the dungeon to the teleport. You can’t do anything. You can swing your sword a bit but that’s not much good. You can’t take it all with you. You have to unpack. But there is one other option. There is a pair of spells that you can use to actually go where you want to go, without needing to walk when you get there. Mark lets you pick one point on the map, just one. Recall lets you transport there instantly. Regardless of how much you’re carrying. What happens at the other end? You have to unpack immediately into chests or crates or boxes, but those things themselves have a finite limit on how much they can contain. You can’t put all your things in one cupboard, because the cupboard is just not big enough. Unless the cupboard is Ralen Hlaalo. Ralen can take as much ebony and glass and assorted swords and bandit armour as you can loot. He will even obligingly cover his nakedness – assuming you have stripped him to sell his expensive clothes – with whatever arms and armour you happen to have looted. He does not rot. He does not require gifts or moral decisions or tribute. He will not send you on a quest, beyond avenging his death, which you’re free not to do with no consequences. You can set your Mark spell within reach of his glassy eyes, load him up with your spare things on arrival, then jaunt down to the pawnbroker where you originally sold all his fancy glassware and, in a few trips with some awkward 24-hour rests in the middle, be significantly richer for little extra effort. He is obligingly calm the entire time. 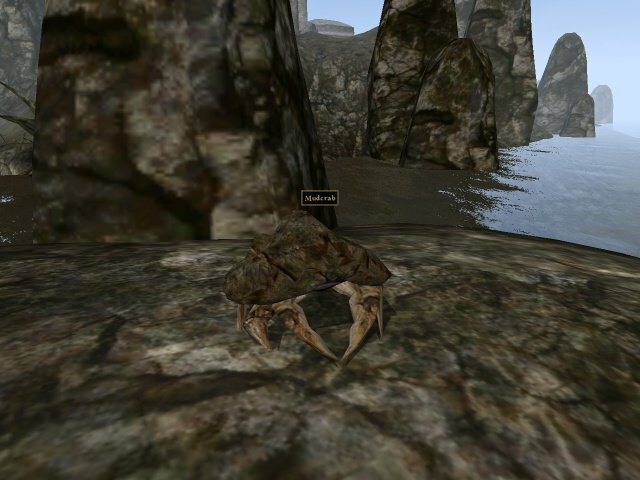 In one game, I appreciated his use so much I summoned him a giant talking mudcrab friend – the mudcrab is the richest merchant in the game, and normally lives on an inconveniently distant island to the east of a Dwemer ruin, but you can use the console to position him wherever you’d like. It is the only time I have ever cheated in Morrowind. I’d like to tell you it was so that Ralen wouldn’t be alone. Honestly: I did it all for the gold. But by that time, I didn’t need the gold. I had more than 300,000 gold. There is nothing in Morrowind that costs even half that much. I had crates of alchemical ingredients and the skill to create any potion I wanted in qualities better than I could buy. I had one of every helmet in the game, carefully displayed on one of the sets of shelves. I had all 36 of Vivec’s sermons, stacked on the long dining table. I had Azura’s Star and Mehrunes’ Razer and the Fork of Horripilation. I had stacks of legendary weapons and the best light, medium and heavy armour in the game. I was the leader of the Mages, Thieves and Fighters Guilds, the head of House Hlaalu, one of the highest ranked members of both the Temple and the Imperial Cult, well on my way to being declared the Nerevarine. I had a giant, talking mudcrab filling half the space in my hallway, occasionally obstructing the door and making weird chittering noises, because I wanted more gold. My best friend was a cupboard. Ralen Hlaalo didn’t judge me. Ralen Hlaalo is the only NPC that I can recall having a relationship with that was sustained, reinforced, by the game’s systems. I return to him time and time again, every time I play Morrowind: I loot his house, I steal from his maid, I sleep in his bed, I strip his corpse. He is not a cipher or a character. He is a system. He is a cupboard. He is the most memorable NPC in my twenty-odd years of gaming, because he is the only one that never pretended to be human. Played Miasmata today for the first time, and had some loose thoughts about islands and slowness and learning terrain in fictional landscapes. Morrowind is still one of my favourite games and the one that I know best, and every time I move house significantly I tend to fire it up out of some deep need for a familiar space. I didn’t notice I did this till the Sydney move, when I didn’t feel properly grounded till I’d managed to get the PC set up and then walk at starting-character speed from Seyda Neen to Balmora, for the thirtieth time or so. Morrowind doesn’t have fast travel, or regenerating health or mana. Depending on your character choices at startup, you’ll start at a level where you have difficulty defeating even the weakest of enemies, and going up against bandits or other human attackers would be impossible. There are travel networks – boats, silt striders, the Mages Guild teleportation system – and some spells that will teleport you to the nearest shrine or temple. And one that lets you set a waypoint then port back to it. That’s enough to let you navigate and move quickly between major cities, but most of the time the things you head out to do are in the wilderness, in the areas that those systems don’t reach. That creates a world that demands time, exploration and slow discovery. If you want to experience all the different parts of the game you will have to walk the same paths many times, growing accustomed to the geography, finding shortcuts as you go. With no way to port back to town to pick up supplies then pop back to where you were, you have to plan your trips based on how remote your destination is, what supplies you might require, where you pass through on the way, which tasks you can do together to save travel time. Your quests are not marked on any maps, so you find yourself leafing through journal pages to find the descriptions that will take you where you need to go. North-east of Vivec into the Daedric shrine Ald Sotha to find the flower Roland’s Tear growing on the east side. South past the Dwemer ruins and take the second road heading west to Malacath’s shrine. Later Elder Scrolls games let you fast travel between landmarks, which promotes a completely different engagement with the landscape. Instead of carefully plotting your caving trip to make sure you can survive it, weighing up the wisdom of leaving your course for an unexpected dungeon, you can wander off-track however you like and take on new challenges knowing you can simply teleport back when you’re done. You find new locations not through landmarks and directions but through a marker on a minimap and then charging directly towards it, detouring to unlock new locations so you can teleport back next time and have a shorter distance to walk. You rarely walk the same path twice. 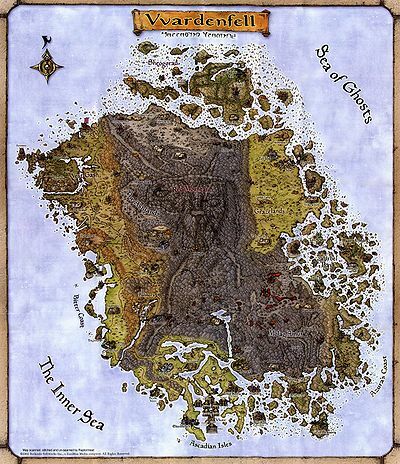 Let’s be clear: this is, for most people, a vastly less frustrating system; Morrowind now feels antiquated without fast travel, and Miasmata a little old-fashioned. But it has its drawbacks too. For one thing – despite its limitations, alchemy in Morrowind is a more satisfying skill than in later games. The gathering of ingredients is a natural part of travel: I am walking south of Balmora towards Hla Oad for a quest, so on the way there will be cornberries to make Restore Magicka potions and corkbulb root for Restore Health.With fast travel, gathering relies on serendipity and snapping up what’s there, and much of that synergy is lost. I’m not too far along in Miasmata yet, but it shares a lot of design similarities with Morrowind in the way it slowly opens up deep knowledge of its landscapes to the player. Like Morrowind, it is an island, though a much smaller one. Islands are different metaphors to walled cities or vast plains: they’re exciting and exotic, sometimes dangerous and sometimes unexplored but always distinctly separate, finite and bounded spaces that seem knowable, understandable, if you put in enough time. Proteus takes advantage of this, as do GTA3 and Assassin’s Creed 4. On one hand it’s a simple way to gate locations and avoid invisible walls; on the other it’s a canny way of making self-contained worlds. Morrowind’s and Proteus’s are about uncovering, exploring and making known; Miasmata’s is also about those things, but it adds in being cut off, having no escape, being trapped. Miasmata’s map is manual, and if you don’t know where you are – if you are in the woods with no landmarks visible – then you are lost. You can find maps that fill in blank spaces for you, but if you don’t have a map then you must start to triangulate your location using the landmarks you do know about to help you. Location in Miasmata (as in Morrowind, as in survival Minecraft, as in Dark Souls) is a resource, something that can be lost, something that requires significant player effort to maintain. The game forces you to husband resources before you make foraging trips, plan your proposed routes carefully, make sure you can carry back everything you might find, think about timing to avoid being stuck in the woods at night with no light. So it’s sensible to keep to the paths, so you know where you are and where you are going. But your objectives, the flowers and plants that hold the cure for your mysterious plague, are generally off the beaten track. Leaving the path is a gamble you must make. I learn cities by walking them. Two months after we moved to London I decided to walk all the Tube lines in segments as long as I could; tendonitis meant I only got about a third of the way through, but by that time I already felt much more like I owned the city. You can walk it, so it’s yours. You see the details, the shortcuts, the things you miss on subways (which are basically fast travel with really long loading times). You know the bones. There’s a quest in Morrowind, a pilgrimage, in which you visit a priest in Vivec, the largest city in the far south of the map. You take a vow of silence, which prevents you from using any of the transport systems because you can’t speak to pay your fare, and you must travel to the Sanctus Shrine, at the absolute north edge of the map. There are some things you can do to make the journey shorter, using teleportation spells or spending significant time first to restore a semi-secret transportation network that doesn’t rely on speech. Given the choice, though, I would always rather walk.